“Who can look up your Timeline by name?” Anyone you haven’t blocked. Facebook is removing this privacy setting, notifying those who had hidden themselves that they’ll be searchable. It deleted the option from those who hadn’t used it in December, and is starting to push everyone to use privacy controls on each type of content they share. 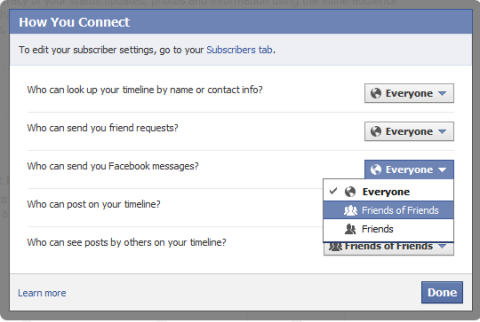 But there’s no one-click opt out of Facebook search. To be fair, the “Who can look up your Timeline by name?” feature was likely misunderstood by lots of people. At first glance, you might assume it means that strangers can’t find your profile. But that’s incorrect. There have been lots of ways to navigate to your profile, like clicking your name on a photo you’re tagged in, finding your name in a friend’s friend list, or combing through Likes on a mutual friend’s News Feed post. With the roll out of Graph Search, the avenues for sniffing out someone’s profile grew exponentially. Basically every piece of personal information (and soon the content you post about) could bring you up in a search. If you publicly list that you live in San Francisco, a Graph Search for “People who live in San Francisco” could lead someone to your profile. It also led people to think search was broken in some cases. If I met someone through a Facebook Group and wanted to friend them, I might search for them and not be able to find them if they had used this privacy setting. But what’s more important are the safety implications. Keeping this privacy option around gave people a false sense of security. For that reason, it’s wise for Facebook to remove it. But it should have provided an ever stronger universal privacy control for opting out of search, not a slew of weaker ones. After that, the way people can stay hidden is to manually restrict the visibility of each piece of their profile. And that is a bit of a chore. You’d have to go through every piece of personal information in your About section and set its visibility to ‘Friends’ or ‘Only me’. At least Facebook provides a quick way to restrict the visibility of all your old News Feed posts. Serious privacy aficionados should remember that your current profile picture and cover image are always public, so you’d have to leave those blank if you didn’t want anyone to any idea of who you are beyond your name. One solution is to use a fake name. Though that violates Facebook’s terms of service, it’s a popular solution for job seekers and privacy buffs to avoid bosses and ex-lovers. This is where there’s friction, as Facebook’s mission to connect the world, responsibility to generate returns for its investors, and its duty to keep people’s privacy safe come into conflict. Facebook is not just trying to make more money, and designing easy privacy controls is no simple task. In the last two years it’s added in-line controls for everything as well as privacy shortcuts in the navigation bar, but I feel like Facebook could do more. The social network could surely offer an option to lock down all your personal information the same way it does for your old posts, but it doesn’t. It could offer a way to opt out of appearing in any type of search results, not just searches for your name, but it doesn’t. It wants your friends to be able to find you. It wants Graph Search to be a comprehensive utility. It wants to foster the connection your friendship and News Feed posts generate, which also keep it in business. But it’s protecting its access to these things by sacrificing your right to choose just how much your identity is indexed.